I finally got round to populating these boards I ordered from Matthias a few years ago and they are now in the modular & working . The TH cmos 555 ADSR .... - before I started populating I had a look at several interesting posts here on EM and other forums , I used TLC555 & CD4052B on both boards & the 2 x 47K to pin 6 - resistor mod . The TH cmos 555 LFO .... - For this modules Controller wave select switch, I got my on-on-on toggle switches from a guitar shop they are popular for selecting neck/ middle / bridge pickups. When I got the switches home, I used a multimeter to find the switch middle position up/down contact layout and mine were a mirror image of the connect diagrams in the forum threads. 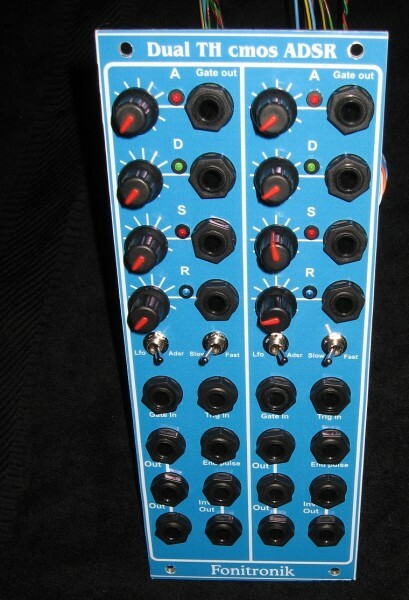 Here is a couple of pics of the modules. They look great! What's this mod you are talking about? Almost all actives are SMT. Works great, I really like these ADSR's, I do feel that they are better suited to slow stuff though, could be the combination of capacitor and slider values (I couldn't get 500k so I used 1M, and used 470nF rather than 1uF for the cap). I built these using the bright red pcb's , Matthias sold a few years ago. The 47K mod , on Mw site , I followed the cmos555 ADSR thread by Matthias and near the end pages there is a discussion about the lfo function , on my unit when I first built & tested it had the same problem when turning the attack or decay back to CCW and it froze the lfo , by bending pin 6 of the opamp up from my socket and soldering a 47K to ground and another to +V it made that section into a comparator and allowed the lfo to not freeze . I really like these ADSR's, I do feel that they are better suited to slow stuff though, could be the combination of capacitor and slider values (I couldn't get 500k so I used 1M, and used 470nF rather than 1uF for the cap). Hey Dave, thanks! This is it in action (without front panel). PCB is pretty tiny, it was a bear to route all the tracks (also because of the sliders on one side and SMT on the other side), but when building it, it is actually not that great a number of components, a pretty quick project to build. I am a bit surprised that not more people report about building it. I didn't implement the end of stage outputs, so mine doesn't cycle.